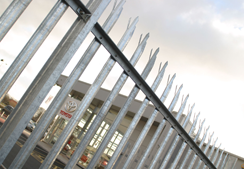 Palisade provides an immediate visual deterrent and is widely renowned as the most popular security fence. Although all palisade systems may look the same, there is in fact a vast range of specification combinations to choose from, meaning there's a palisade fence for every application and budget. Peart metal palisade fencing is manufactured in both the standard 'D' and 'W' profile, as well as in a variety of thicknesses. Panels are normally supplied loose for assembly on-site in bays of 2.75m. Although bays are typically supplied in a loose format, a fully welded option is also available. Peart palisade gates are manufactured from rolled, hollow sections and are clad with pales to match the design and structure of palisade fencing. Gates can be manufactured in a range of sizes, typically from 0.9m to 16m. Palisade security fencing Posts are generally 98*55 IPE posts or 102 x 44 RSJ (please specify RSJ at enquiry stage if required) – however, for a higher security installation 127 x 76 UB can be supplied. Palisade fencing Posts can also be manufactured with base plates, wall fixings, extensions for barbed wire, cranked to go over walls or bespoke to meet the requirements of the site. To fix the pales to the rails two types of fixings are available. Rivets and collars (M6 and M8) for which a fencing rivet gun is required or M8 bolts with Permacone fixings, designed to snap off during erection for a secure fixing. PeartPalisade fencing can be supplied self-coloured, galvanised or galvanised & polyester powder-coated in virtually any colour to order. Rails are available in four sizes, 40 x 40, 45 x 45, 50 x 50 and 65 x 50. The size of the rail is dependant on height of palisade fence and level of security required. PeartPalisade gates are manufactured from rolled hollow section and clad with pales to match the palisade fencing. Gates can be manufactured to any size from 0.9m to 16m, to the relevant British Standards or to meet the requirements of the site. The above specifications are suggested for general purpose fencing and can be changed to suit specific site requirements. If you have any questions about our products, don't hesitate to ask! Our team of trained representatives has worked diligently to ensure that each of your needs will be met, assessed and fulfilled in a satisfactory and expedient manner. This is just one small element of our larger commitment to customer service and honest business practices. We've included additional information about our palisade fencing supplies below.